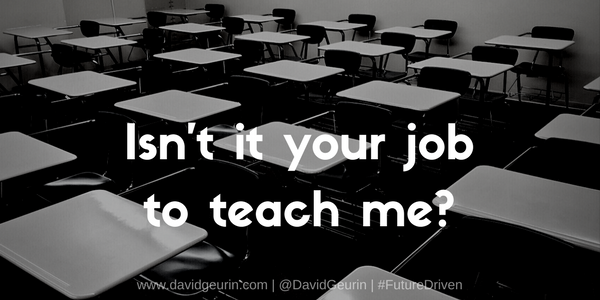 The @DavidGeurin Blog: Isn't It Your Job To Teach Me? The teacher asked her students to make some decisions about the direction of the learning. The lesson required independent thought and initiative. But one student resisted, "Isn't it your job to teach me?" Have you ever heard a question like that from one of your students? It's a question that was asked by a student in our school. And to me it illustrates the way many students have come to believe that learning is a product of their compliance with a teacher. Just tell me what I need to know. Tell me what to do, what to learn. Teach me. Isn't that YOUR job? Another student said to me, "I just want to take notes and then have a test." This comment came from a student in a classroom where students are expected to own a considerable amount of the learning and develop original thoughts. Learning in this class is demonstrated through projects and authentic activities. I don't blame these students for thinking this way. I think, at least in part, they are simply a product of a system that has conditioned them to be passive learners. So who owns the learning? The student? The teacher? Both? How would you respond if you heard these words from your students? Leave a comment below or respond on Facebook or Twitter.